The original Mazda 323 was a reliable entry level car. When the GTX came out, it had four wheel drive, an electronic gear lock for low traction, and a turbocharger that made 50 more HP than stock 323. Remember, there were no WRX or similar cars at the time. The GTX cost nearly twice as much as a stock 323 and only 1200 were ever imported. Now, what could be more fun? Take the mild mannered 1600 cc 323 GTX with the coefficient of drag of a parachute, install a full cage, programmable fuel injection, variable cam timing, and water injection and make a rally car. No, wait, I’ve got it, let’ take the same car install a turbo the size of Texas, put 3 fire systems and parachute then run almost 180 mph on the Bonneville salt flats. This is truly an interesting car. Remember when the AWD Audi rally cars were going so fast they plowed into crowds on weekends? They were 3 liter turbos. FIA did something about it and briefly changed the displacement of rally cars to 1.5 liters for about 3 years before settling of the current 2.0 liter AWD rally cars. Mazda saw an opportunity for the 323 GTX in the 1.5 liter formula. A racing shop in Greenville, SC built 6, 323 GTX rally cars. I don’t know the rally result for this car but somewhere along the line the one I own was converted to a Land Speed Record Car. The car came with a full interior but also a full cage. The driver’s seat became a Kirkey. A very large turbo for high end performance was added (unbelievable turbo lag—unbelievable acceleration when it finally hit). The variable valve timing set up plus water injection and 25 lbs. of boost produced 450-500 hp out of 1500 ccs. The smaller 1488 cc engine ran 154 mph and the larger 1600 ran 177.301 at Bonneville. The car also set records in the Eastern Timing association until it swallowed a valve. I bought the car several years ago with the idea of making it a rainy day road race track event car. I ran it at VIR raceway. One thing I forgot is that rally driver only uses brakes to slew the car sideways and to stop at the end of the session. Road racers need more even in the rain. Coming on to the straight, there were faster cars behind me as I had the foot to the floor trying to build boost. I would always get the move over flag but would try to wave it off because when boost finally hit it almost lit up four racing slicks – funny but not too drivable. I was also the only road race car on the track with a parachute on the back bumper. It was apparent, that the T4 turbo had to go, the car has the race motor with a knife edge billet crank, I beam connecting rods, variable valve timing, racing pads, lowered suspension with coil overs and a 944 turbo that spins up fast to 8500. There is a programmable fuel system for the fuel injection. Ironically by lowering the boost to 15 lbs., reducing the advance and making a smaller turbo has produced an ultimate street sleeper(full cage gives some away) with a Dr Jeckyll and Mr.Hyde personality. The car has full liquid filled auto-meter gauges, variable boost, full fire system, water injection and is completely street legal. The car still has its official SCTA number for Bonneville and tech stickers. The car has lots of personality, a real good sound above 7k rpm and lots of boost and traction. Probably the best use of the car is making Mazda’s reputation against turbo civics or WRX’s. The car is drivable as is but it could be put back to high boost but this time with no turbo lag. For right now, it attracts lookers and interest wherever it goes and people love the idea of seeing a Bonneville record car first hand. I probably won’t do rainy day road racing but is drivable enough to do it if I want. Right now it is fun to have one of the most unique low production Mazda’s in the world (only 8k miles). This is the ‘90 RX-7 of Merritt Nord. He bought it from a person who worked at the Department of Labor and has given it new custom paint and top. After reading numerous road tests, and test driving a Mazdaspeed 3, I decided that this was the perfect vehicle for me. It took several weeks, to locate the right car. I purchased a GP 5-door w/o a navigation system. My Garmin Street Pilot 2830 works fine, and much easier to program. The ‘cold air’ and ‘exhaust’ kits were ordered, but not installed when I took delivery. Both were installed later, and are well worth the money. The car was driven home from the dealer, the tires were filled with Nitrogen, then off to Gingerman Raceway (South Haven, Michigan). the next day for it’s first ‘track day’. It had 330 miles on the odo when I arrived at Gingerman. Needless to say, I did not ‘push’ the new car hard the first day. It was immediately apparent that this little beast was more than I expected. Switch off the TSC, and it is a ‘hoot’. Press it hard into a turn and it will under steer , but a small lift-throttle and it rotates beautifully. Shift @ 6000 rpm, and it pulls like a train. The brakes worked great on short tracks. More on that later. I had the oil changed to Castrol synthetic by the dealer at 1000 miles. The cold air, exhaust, were also installed. Since I am too old, tired, and lazy to carry ‘track tires’ , I expect to run my street tires on the track. The Bridgestone RE-050 tires do fine. They have adequate grip, and you can do 4 wheel drifts without fear of being launched into the Armco. Plus they have great road feel, and decent tread life. Having done four track days (2 @ Gingerman, and 2 @ Autobahn Country Club), I was looking forward to the ACNA event at Road America in Sep. RA is a 4.2 mile track and has 3 long straight aways. The MS 3 had no problem hitting a buck 30 on each straight, and eating most all of the stock A-4’s through the twisties. However, after 15 minutes on the track the front brakes started to get spongy. I had to pace myself for at least one lap to let them cool. I have a Brembo Brake Kit on order from Street Unit Performance Inc (www.streetunit.com). The Mazda Speed 3 is a bargain at $25K. Wicked fast, and very ‘stealth’ compared to the EVO or STI. 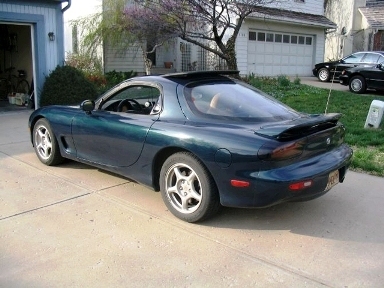 Okay, it is not AWD, and the brakes are not the best, but it comes fully equipped, and with a Mazda warranty. There is over 5 feet of length In the back with the seats folded, and after market upgrades are available at a reasonable cost. If you can find one, buy it……….you won’t be disappointed.